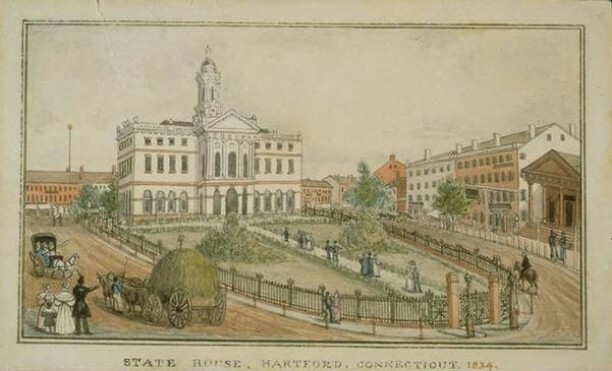 On December 15, 1814, delegates to the Hartford Convention met in secret at the Old State House in Hartford. The Massachusetts legislature had requested the conference in October and delegates from the Connecticut, Rhode Island, Vermont, and New Hampshire legislatures met for three weeks to draft a formal protest against the Federal Government’s continued involvement in the War of 1812, which allied the United States with France against Great Britain. The delegates represented the dominant political party in New England at the time, the Federalists, who favored peace—and strong trade relations—with the British. Rumors abounded that the Convention would call for New England’s secession from the United States in order to achieve the Federalist’s aims. Most New England Federalists, however, held more moderate views and feared that even talk of secession might lead to a civil war. The Federalists wanted to address the policies of two successive US presidents from the opposing party: Republicans James Madison and Thomas Jefferson, who the term prior had implemented the Embargo Act of 1807. Jefferson had tried to use the embargo as an economic force to address the conflict with Britain but the Federalist’s viewed the embargo as a policy that devastated New England’s economy. Madison imposed more economic sanctions but by June 18, 1812, Britain and the United States were at war. The New England states did not support the war. They feared a land invasion and refused to place their militias under federal control. The Hartford Convention resulted in a declaration calling on the Federal Government to protect New England and to supply financial aid to New England’s badly battered trade economy. It also advanced recommendations for a few Constitutional amendments, including requiring a two-thirds majority vote in order for war to be declared. The Convention’s final report was issued on January 5, 1815, and read into the records of the US House and Senate. Its timing, however, was ill-fated. News reached the US in January that on December 24, 1814, while the Hartford Convention was still in session, US delegates in Europe had signed the Treaty of Ghent which ended the war with Britain. Kim Sheridan is a researcher and digital curator who holds a Master’s Degree in Library Science from Southern Connecticut State University. “The Avalon Project: Amendments to the Constitution Proposed by the Hartford Convention: 1814.” Yale Law School, 2016. Link. Dwight, Theodore. History of the Hartford Convention: With a Review of the Policy of the United States Government Which Led to the War of 1812. New York; Boston: N. & J. White; Russell, Odiorne, & Company, 1833. Link.